please e-mail me at your convenience? Thanks. 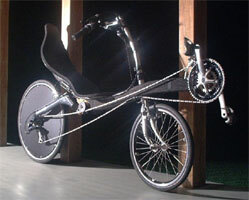 Eric has built a really cool short-wheelbase Carbon Fiber bike based upon the bike shown below. Do go to his web site and check out not only the design but building processes. 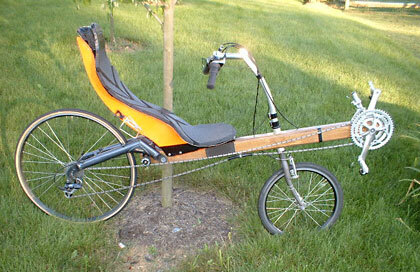 Here is Eric's "Woodie" - a very successful and much-ridden recumbent. "The bike is a rear suspended SWB, with a 48 inch wheelbase. The main "beam" is a plywood sandwich. It has a total of five layers of birch plywood. The three core layers are 13-ply 3/4 inch, and have been hollowed out to save weight. They are solid only near the BB, head tube, and where the rear swing-arm attaches. The outer layers of the beam are 5-ply 1/4 inch plywood. The frame weighs about 4 lbs and is very stiff. 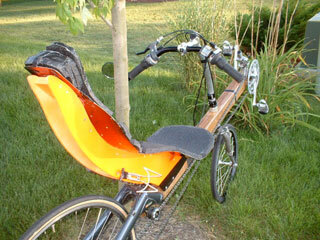 The seat frame consists of two 1/4 sheets of plywood separated by small pine blocks. A sheet of aluminum is screwed to the blocks and covered with foam to make the seatback. It has an integrated headrest. The rear swing-arm came from a dual suspended 20" mountain bike. The suspension unit is hidden by the seat, but the arrangement is like an HPV SpeedMachine. I have tried to keep the chainline as close to the pivot of the swing-arm as possible, and I put a heavy preload on spring, so the suspension is only "active" when I hit larger bumps, and there is no "pogo" when I'm really pushing hard on the pedals. In the pictures it has a 700 C rear wheel but I have since switched to a 26 rear wheel. I prefer the 26 inch wheel because is lowers the seat to about 22 inches, making it more comfortable to set your foot down at stoplights. rear swing-arm has pivots which would allow me to add a rear brake , but only if I use a 20" rear wheel. I have ridden it with a 20 inch rear wheel and it's pretty cool, very low and laid back. However, the gearing is too low with the small wheel to take advantage of the aero position. I've tried adding a 63 tooth front chainring, but unfortunately my derailleur post is not angled properly to make this work. Overall, I'm pretty happy with it for a first try. It handles pretty well at all speeds and although it is not all that low, the aerodynamic advantage over my road bike is very noticeable. The weight is 29 lbs. I have not decided for sure what version two will be. I think I would like to move the seat back a bit and move the head-tube forward, perhaps by as much as 8 inches. These changes will move more weight to the suspended rear wheel, giving a smoother ride. Right now, a bit over 50 percent of my weight is on the front wheel, and crossing railroad tracks is pretty rough. I think putting more weight on the larger rear wheel will reduce rolling resistance a bit as well. I'd also like to lower the seat height for better aerodynamics. I need a second brake too. 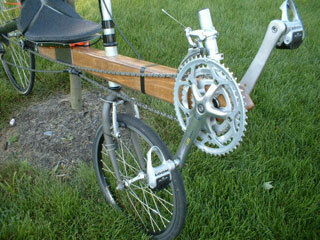 I am also considering using carbon fiber, or even trying welding, however, wood works surprisingly well."